Currently, inflation is “uncomfortable”, but not spiraling out of control. The outlook for the economy darkened recently, but we're not staring down the gaping maw of recession just yet either. The two opposing forces roughly in balance, Fed policy continues to be level, unchanged. Increasingly, though, it seems that precious metals have gotten off this see-saw altogether. They're over on the swings, let's say, gaining momentum and seeming to fly higher and higher no matter what the other kids say. Almost two decades ago, when Robert Fulghum penned the short essays that appear in his classic book of sentimental optimism, he probably didn't imagine that typically straight-laced analysts would similarly revert to childish oversimplification and use a character from a fairytale to describe a new strategic outlook on economies and markets. Or that the devolution would persist more than a decade and three presidential terms. But here we are. Still. Though he thankfully avoids using the term, Ben Bernanke made headlines last week when he essentially confirmed what you read here two weeks ago and politely disagreed with Alan Greenspan's fusty old boom/bust paradigm in favor of the perpetual, sustainable growth model that is the real policy directive behind what has come to be known as “Goldilocks”. Stock markets didn't immediately share Bernanke's optimism, but then again, Goldilocks herself never seems to get it right on the first try, either. Too hot, too cold … in fact, stubborn persistence in the face of mounting odds against her is essentially the hallmark of the Goldilocks archetype. Or maybe it's naiveté. For more than two weeks, this update has been awkwardly suggesting, and clumsily making the case, that despite the persistent trend which has seen the precious metals trade higher with stocks and inflation, a shift towards a weaker economy and, therefore, rate cuts, could still be bullish for metals. This week's trading saw the most tangible manifestations of this yet. The reaction to Bernanke's testimony, if that is indeed what it was, signaled a certain lack of faith in his continually rosy outlook. Downward revisions in GDP forecasts, rising housing inventory, borderline manufacturing, slower corporate profits, and most worrisome of all, weak capital expenditures, all have many traders wondering how long the economy can hold on without some sort of accommodation from the Fed. The market, in other words, has started the shift back toward the psychology of last fall where good was bad, up was down, and rate cut expectations were the norm. Metals trended higher during most of this period, and, as we saw last week, metals were resistant to much of the selling pressure seen in stocks. But, of course, the markets are far from clear on the future of interest rate policy, or of anything else, for that matter. For what it's worth, the bond market is decidedly undecided. Despite steepening action that corrected the long-standing inversion between 2- and 10-year T-Notes that seems to decrease the odds of a recession, the yield on the 2-year is still hovering above the 4.5% range, signaling that bond traders have not committed to a recession and rate cuts quite yet. Most of the action has instead focused on the longer end of the curve, indicating that inflation is the predominant concern. As we know, inflation-related data continues to come in at or above expectations, making a rate cut all but impossible. But this shouldn't really be a surprise to a Fed that's taken M2 to a new record high of $7.16 trillion. Investors can hardly keep themselves from buying precious metals on news like that! Add to the mix that Europe's money supply is growing at the fastest pace in 17 years, while Russia just tacked on the largest weekly increase in reserves ever, and the stage is set for a sustainable future alright… in metals! 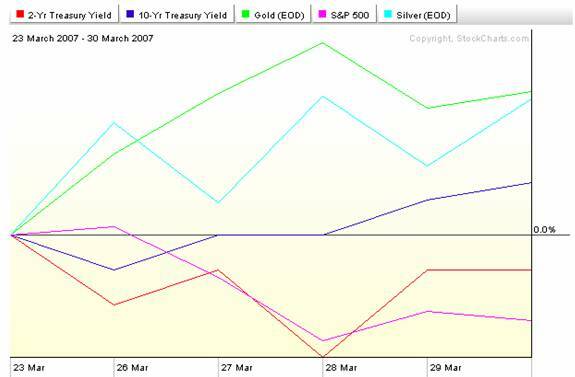 As we noted last week, though, even the metals have certain technical obstacles to overcome if they are to advance at the same staggering pace as the last five years. 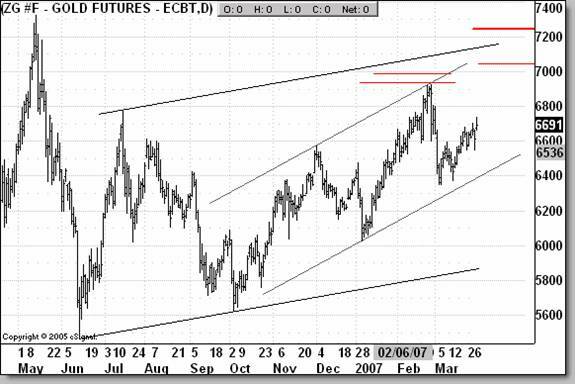 The chart below shows clear targets in gold near $700. Failing to surpass the line above $720 in the next several months could send the yellow metal back below $600 before the rally resumes. 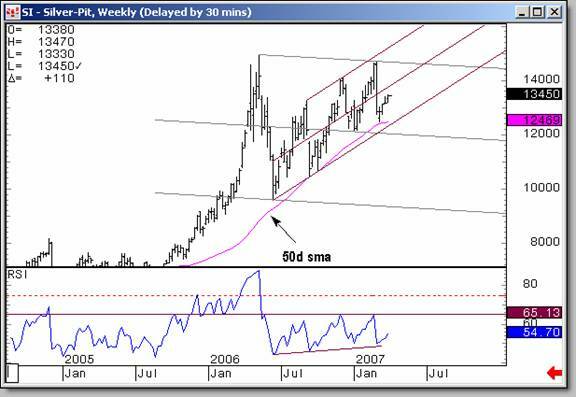 Silver has put in strong support near the 50-day moving average, but has struggled to hold the upper trend channel off its summer '06 lows. Eventually, silver will have to address the downward trendline from last May's high and either breakout or consolidate before any further advances. It hardly takes a PhD in economics to understand that whether the Federal Reserve tightens incrementally to look tough on inflation for which it is almost entirely responsible, or whether it makes a small cut to support a busted housing market for which it is entirely responsible, precious metals are poised to be the long term beneficiaries of either policy choice. With India raising its overnight lending rate last week, and Europe and Japan likely to extend their hikes later in the year, the global trend towards tightening appears to be the only credible threat to the metals bull – IF the hikes ever manage to outpace economic growth. The Fed may never actually have to cut, but in the global context, holding steady rates amounts to a de facto accommodation. If the Fed can't keep up the pace with other countries, at least in dollar terms, metals will continue to be a quality investment. Whereas the Goldilocks story is about getting results, the Goldilocks economy always seems to be more of a promise than a reality, more of an expectation than a destination. While past FOMC statements have held rates steady with an explicit hiking bias, the latest edition truly depicts a Fed now truly on hold and undecided. So long as the Fed can sound convincing, it can continue feeding both sides of the bull/bear debate. But, if this week's reaction to Bernanke's testimony is any indication, it may be almost time for the Federal Reserve to grow up and pick a side. This update is provided as general information and is not an investment recommendation. TTC accepts no liability whatsoever for any losses resulting from action taken based on the contents of its charts, commentaries, or price data. Securities and commodities markets involve inherent risk and not all positions are suitable for each individual. Check with your licensed financial advisor or broker prior to taking any action.